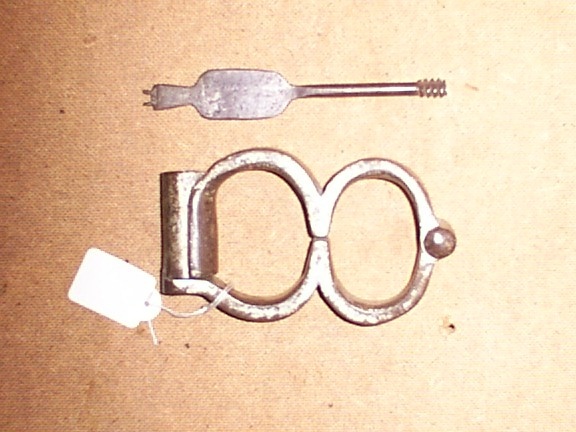 Re: Can anyone identify a handcuff marked S.F. Co. ? : a standard 3 marking. : Can anyone tell me anything about the S.F. Co. ? Don't know anything much about S.F.Co I have come across a few of their darby pattern cuffs (have just put one on ebay). It is possible the F stands for Fitzwilliam - again not too sure what documentation exists to show that FWSM was Fitzwilliam & Son Manufacturing. The Figure '8' cuffs are quite rare and I have only come across a couple of these. There is another company which produced cuffs marked S.M.Co they were one of the few or possibly the only handcuff manufacturer who were based in the South of England (rather than the Midlands where Hiatt, Froggatt, Griffin, Dowler came from). They produced the standard Darby pattern, figure '8' darby and a very heavy Boar War type plug '8' cuff but their key design was completely different. Will send photo.